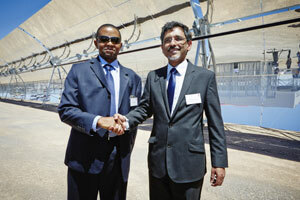 South Africa’s first solar thermal electricity plant – and the largest in the southern hemisphere – has been officially opened in the Northern Cape. 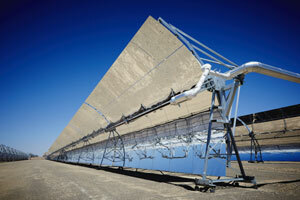 South Africa’s first solar thermal electricity plant to reach completion was officially opened near Pofadder in the sparsely populated Northern Cape on Monday, 2 March 2015. The arid region’s relentless sun is proving to be a valuable renewable natural resource that ultimately will benefit the local community, the country as a whole, and the environment. KaXu Solar One was opened by Geoffery Qhena, chief executive of the Industrial Development Corporation (IDC); Economic Development Minister Ebrahim Patel; Armando Zuluaga, chief executive of Abengoa Solar; and Fadiel Farao, chairman of the KaXu Community Trust. All are partners in the project. “It is the result of partners working together. And it has demonstrated South Africa’s capabilities in converting the Northern Cape’s sun into a rich, useable resource,” said Qhena. KaXu, which means “open skies” in the local Nama language, will add 100 megawatts (MW) of electricity from the sun to the national grid – the equivalent of about 320 gigawatt hours of electricity a year. “This is equal to the consumption of 80 000 houses, so serving more than 400 000 South Africans. In practical terms, this is the consumption of all the households in Mossel Bay, Oudshoorn, Knysna and Swellendam combined,” said Patel. The plant covers an area of three square kilometres. It is made up of 1 200 collectors: each collector has 10 modules, each module has 28 mirrors, and in total there are 336 000 mirrors on the plant. The mirrors track the movement of the sun. Importantly, STE technology allows electricity to be stored for up to two-and-a-half hours, which means power can be supplied to the national grid when it is needed most – at peak time after dark. And it saves 315 000 tons of carbon emissions per year, said Zuluaga. Qhena said the IDC recognised the key importance of the green economy, and had increased its focus in renewable energy as a means to reduce reliance on coal-generated power. Developing the new industries had “facilitated job creation, the upliftment of rural communities, skills and industrial development,” he said. The IDC’s involvement had seen the industry become more competitive and attract interest from different players – demonstrating its role in de-risking the sector. The corporation would continue to play a role in green industries, and extend this to financing projects in the rest of Africa. This was a major opportunity for the IDC in Africa, and “partnerships like this with the government and the private sector will assist this”. There were massive benefits in supply chain in Africa, and the IDC was working tirelessly to ensure that South Africa benefited from industrial development, Qhena said. KaXu has a capacity bigger than the installed capacity in the whole of Lesotho, said Patel, who also spoke about other initiatives: on 3 March, the Kakamas Hydro Electric Power plant will be opened on the Orange River, adding a further 10 MW to the national grid. 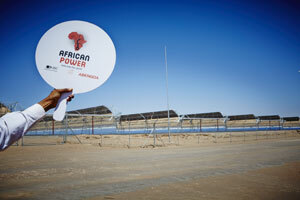 The total investment in KaXu came in at R7.9-billion, with about R1-billion coming from Spanish group Abengoa. The balance was supplied by the IDC, Nedbank RMB, the Development Bank of Southern Africa and the International Finance Corporation. KaXu is owned by Abengoa (59%), the IDC (29%) and the KaXu Community Trust (21%). The risk was carried by Abengoa, said Patel, which had put in its equity. An important benefit is the value of the project to the rural area of Khai Ma. During construction, 4 500 jobs were created, 80% of them local. 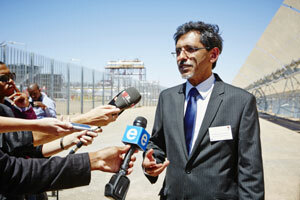 Now during operations there are 80 permanent jobs, and South Africans are being trained to run the plant. Through the trust, the dividends would be invested in long-term projects that would benefit the community for generations to come, said Fadiel Farao, chairman of the KaXu Community Trust. Projects would be in education, health, and skills development. The life of KaXu is 20 years, but there is an emphasis on growing local manufacturing of the components, which will allow the country to build a solar power manufacturing sector. “We pay more for renewable energy, so we must have a better return,” said the minister. Renewable energy used to cost 100% more than coal-fired power; now that cost had dropped to 50% – and this was dropping all the time as more companies invested in new technology.